BBC News is the department of the British Broadcasting Corporation responsible for gathering and broadcasting of news and current affairs. BBC News is the world’s largest broadcast news organization and generates about 120 hours of radio and television programming each day. The site records around 40 million unique viewers each week, around 60-70% of which are from the UK. The website is cluttered with advertisements and news images. The top bar offers quick links to the typical news categories (sports, weather, travel, future, TV, and radio). There is a rolling slide that features four more news columns (entertainment & art, health, technology, and science & environment) They also offer a market watch ticker. There is a lot of white space which leads to continuous and extensive scrolling. Audience: Viewers of BBC News are typically between the 35-60 age demographic and have a college education. 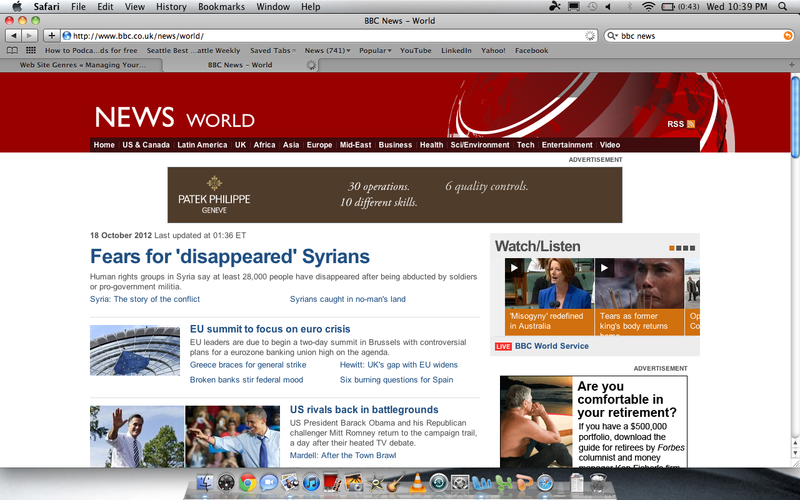 The BBC News website is published in two versions- one for the UK and the other for international audiences. Users to the site are automatically directed to the version based on their geographical location. In this way, BBS News can offer a more relevant selection of headlines. Business/ Site Goals: The website generates business through online, mobile, and print advertising. There are no social media links on the front page at all. After you are redirected to a specific news story page, there is a small “share this page” option that allows you to link to Facebook and Twitter.